Jillian joined AEC in 2016 as a receptionist. She is currently attending Macomb Community College in pursuit of a liberal arts degree, and intends to later apply for their veterinary technician program. Jillian offers a warm and happy personality to the pet owners who visit our hospital, especially those who come in experiencing a stressful situation with their pet. 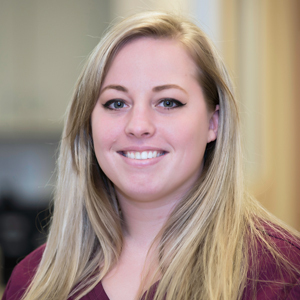 Jillian has always loved animals and maintained a desire to work in the veterinary field. "I remember being in kindergarten and on career day when the teacher asked me what I wanted to do when I grew up - I said I wanted to help sick animals. This thought has stuck with me over the years, and I love being at AEC where everyone is just as passionate about animals as I am!" Jillian says she learns something new at AEC every day because no two cases are the same and we see everything from cats and dogs to exotics like hedgehogs and lizards. She loves seeing our Owners leave the hospital with a smile on their face and a happy healthy pet following right behind them! In her free time Jillian loves to take her German Shepard Sadie on long walks. She also has a Ferret named Dory who loves to be sassy and steal Sadie's toys!